You’ll agree with me that the best way to hone your baking skill is by having the best bakeware set. That’s when baking starts to be an enticing hobby to an extent of baking frequently. 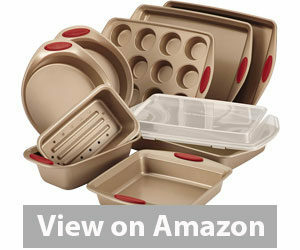 However, it’s not an easy task to select the best bakeware set when given a plethora of bakeware products in the market. They are available in different materials, quantities and styles. The bad thing is to base your choices on pricing as it can be deceiving. I have spent a considerable amount of time assessing plenty of bakeware sets on the market. In simple words, I have saved you time and money by selecting the best bakeware set to take baking to another level. A product of the USA, USA Pan Bakeware set is a 6-piece compilation of various bakeware. It can be a good addition to your kitchen with its 17 x 12.25 cookie sheet, 17.25 x 12.25 half sheet. 8 x 8 x 2.25 inch square cake pan, 9 x 13 x 2.25 rectangular cake pan, 8.5 x 4.5 x 2.75 loaf pan and 12 cup muffin pan. Of course, as a baker you would need different bakeware and to buy individual products could cost you more than a set. I found this set really cost-saving for enthusiastic bakers. What has also caught my attention was the design of this set. While others care about the aesthetic appearance of the bakeware set to decorate their kitchen, I put more focus on the material to ensure that the set lasts long. This set features a unique corrugated surface which ensures adequate air circulation for an even distribution of heat to your bakes. Coupled with that is the non-stick and patented Americoat which is free of BFA, PFOA and PFTE as the harmful chemical coats. Because of the Americoat, you can release your bakes perfectly the way you wanted them without crumbling. What this means is that there will be no need to apply grease or more oil prior to cooking as it was the case previously. The non-stick also helps in cleaning the bakeware after baking. You do not have to employ the damaging steel wool to scrub the bakeware because of sticky residuals. The overall material design is the aluminized steel which is characterized by a good quality and durability. Aluminum is a good conductor of heat and so is the steel. Their composite performs well by combining their unique properties. In turn this enhances durability of the cookware. To assure customers about the quality, the company is offering a life-time warranty. That’s actually a plus in case your bakeware get damaged but provided you are using them as per the instructions. This 6-piece bakeware is recommendable to any enthusiastic baker looking for a variety of cooking gadgets. They are made with the durable aluminized steel which I value. The Americoat is an added advantage to ensure that it remains nonstick. That means no food residues will be hard to remove. Just beware of the metallic utensils you use in the bakeware as it can affect the coating. What I also endorse with the set is the warranty the company offers which guarantees a top-notch quality. Rachael Ray probably resounds well in you as it is a renowned international brand. In this Rachael Ray Cucina Nonstick Bakeware set you’ll find 10-piece of various bakeware products. They are characterized by the heavy duty carbon steel construction and adorned with the latte color both inside and outside. That’s an ideal addition to your kitchen. The edges of each bakeware have rolled rim to prevent warping and make sure the products do not deteriorate with everyday use. Many bakeware products do actually lose value especially when used frequently, but with the rolled rim edges the process can be delayed. The other consideration is an even distribution of heat when baking. You can perfect the browning of your cookies or muffins, thanks to the heat-conducting carbon steel construction. Handling the bakeware is a breeze with the silicone grips on the handles. The grips ensure a comfortable grip so that you do not drop the bakeware accidentally especially when hot. Metal can be sensitive to extremely high heat settings. You need to set to a maximum of 450 degrees F oven heat when baking with these sets. Exceeding that may jeopardize the quality and may void the warranty attached. Important: This heat restriction is only applicable to an oven. Other cooking fire sources may not be suitable. Let’s talk about the nonstick qualities. This is, of course, the important feature in the bakeware to ensure that cleaning and releasing is an absolute breeze. Both the interior and exterior of Rachael Ray bakeware set are nonstick. But I found quite disturbing is that the coating can wear out overtime, whereas the manufacturer discourages the use of the nonstick spray to revive the coating. You may have to contact the seller for help in this regard. The latte finish can actually tempt you to serve guests in the bakeware just to showcase the beauty. Provided you care for them, they can last long in that stage. There is no information about dishwashing safety or restriction. I would say, please be cautioned because the dishwasher can be damaging. If you ask if I recommend this bakeware set, I’d nod my head swiftly. The 10-piece of bakeware set is a great variety to find almost any essential piece you need for your baking. The carbon steel construction is durable and possesses high quality. This is a plus advantage because inferior materials deteriorate when exposed to higher temperatures. Just note the maximum allowable temperature with this bakeware set. One I disapprove though is the prohibition of the nonstick sprays despite the fading quality of the coating. My third choice goes to the Calphalon 6-piece bakeware set. Adorned with a toffee finish, this bakeware set is made of the heavy-gauge carbon steel construction which is high performing in durability. Carbon conducts heat well and ensures that your cookies will be baked well without uneven browning. Naturally, steel is not good in nonstick properties, but the interlocking nonstick layers designed for this bakeware set compensate for that. They enhance a quick release and ease of cleaning after baking. What this means is that you do not need to use the hard steel wool to clean the bakeware. A nylon pad or a soft cloth is sufficient to clean after baking. Moreover, you do not need to waste so much oil to prevent sticking. What you have to pay attention to is the maximum oven heat of 450 degrees Fahrenheit. If you exceed this heat you might subject the bakeware to premature deterioration which is not covered by the 10 year warranty the company offers. If you set gets defects when put to normal household use, the company can replace it. Any improper use or improper cleaning is void of the warranty. Included in this 6-piece bakeware set are the one medium load pan, two 8-inch round cake pans, one 9 x 13” cake pan, one 10 x 15” baking sheet, and one 12 cup muffin pan. These inclusions should be enough for an avid baker even though you might need additional utensils because using metallic utensils might adversely affect the coating. The bakeware set is dishwasher safe. But I would reckon you do not frequent dishwasher as the coating might fade if frequently washed. A soft cloth or nylon pad can be a good method to preserve the coating. To prevent warping with repeated uses, the reinforced rolled edges have been designed for each of these bakeware products. That’s a guarantee that your product will last long because of the carbon steel construction. The products are lightweight; this makes it easy to handle your cookies. For the fact that it is made with the heavy-gauge carbon steel construction, I applaud the product. It has lots of features an avid baker needs. From the nonstick interlocking layers to the reinforced rolled edges which prevent warping, the product is ideal for your kitchen. But you would need additional accessories to store your bakes as the carbon steel bakeware is not a good storage. If I were to recommend improvements, I would call for the large and user-friendly handles that help one to operate the bakeware. I would also call for extra accessories such as preparation bowls or relevant utensils. 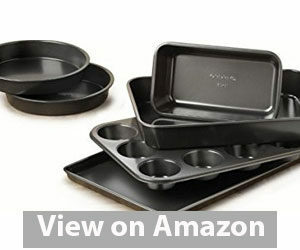 Other that it is a good buy for your investment and it is affordable for a 6-piece bakeware set. Vremi 6-piece nonstick bakeware set is also a worth-considering bakeware set to take your hobby further. What caught my attention is the dark color with some red silicon handles for ease of handling. Even if the bakeware is too hot, using the handles with some cloves or soft cloth is a safe way to prevent heating your hands. Whether you decide to stew meat, bake muffins or cakes, the set seem to have every essential that you need in that regard. 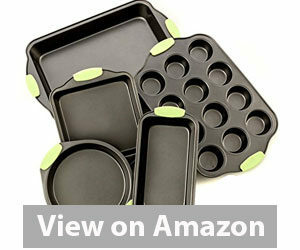 It contains the cake loaf pan, muffin pan, square pan, large roasting pan and baking sheet. If you were to buy these individually, they would cost you a fortune. So buying in a set tends out to be a good investment. Each of these essentials is coated with a nonstick coat that ensures that food is released with ease and cleaning is a breeze. The carbon steel construction is the main material that gives the set quality identity. Carbon steel is durable and conducts heat evenly. That means the cookies or cakes or bread will bake evenly without browning spots. Over the years, some harmful chemicals have been used in bakeware and cookware coatings. These included the PFOA, PFTE and the BPA, which were later prohibited due to health risks. The coating employed in this bakeware set is non-BPA. It won’t react with food and impart harmful chemicals. Furthermore, it is scratch resistant. You are safe to use the bakeware set in the oven up to maximum heat of 450 degrees Fahrenheit. This is only applicable to oven. Higher temperatures may damage the coating which means you might have to replace it before time. I haven’t seen any information about the warranty against such improper heat exposure. Also noteworthy is the proper cleaning of the bakeware set. Unlike my preceding products, this one is not suitable for a dishwasher as stated by the seller. Apparently the dishwasher can damage the coating. Only use the soap and warm water with nylon pad or soft cloth to clean it. Moreover, avoid using sharp or metallic utensils as that can also affect the coating. 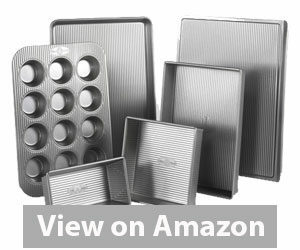 Vremi bakeware set allows you to bake different bakes such as the round or square cakes per the bakeware. They come in different shapes and sizes. You may bake square or round chocolate fudge or bread. Isn’t that convenient? The set might be a good present for birthday or Christmas. Important: Always let the pans to cool before you clean them to preserve the coating. Again, despite the presence of silicone handles, use the oven mitts when handling hot pans. Vremi 6-piece bakeware set is actually a good set when preparing cookies or cakes for the next Christmas. It comes with products of different sizes and shapes that are all nonstick. Based on its carbon steel construction, I am convinced that it lasts long and distributes heat evenly.The set needs no sharp objects or metallic utensils to use in it but it hasn’t included them. That’s what I wish the company would improve on. No mixing bowls or storage containers included because you cannot save directly with the bakeware set. But I found the Pyrex Glass Measuring Cup Set and the Rubbermaid Food Storage Containers as good accessories to pair with this bakeware set. Now my last choice goes to the Pyrex 8-piece Bakeware Set. Glass bakeware has also gained popularity among enthusiastic bakers for its unique properties. We are accustomed to metals such as copper, carbon steel and aluminum as the common bakeware materials, but little do we consider glass as a suitable alternative. Pyrex glass bakeware set includes the 3-quart Oblong, 8-inch square baking dish with its blue plastic lid, and storage dishes with plastic lids too. These sets are great for storing and baking cookies. It means you do not have to have to purchase separate storage containers as the bakeware itself can store food. It is freezer safe, meaning that you can bake and then put the cookies or cakes in the freezer. There are blue plastic lids included which helps to close the containers and safe food. That’s actually a saving compared to buying other materials which are not freezer safe. When it’s time to serve, you can warm up the food in the microwave safely. When baking, make sure to preheat the oven before putting the glass bakeware. Any abrupt to heat change can break the glass. Unlike other materials such as stainless steel, glass bakeware naturally does not let food to stick. You can easily wipe the bakeware after use. This set, in particular, is dishwasher safe, meaning you can forget about immersing your hands in cold or hot water. With regard to coating, it needed no coating at all. A quick release and ease of cleaning are guaranteed. While you have to be wary of reactivity of other acidic foods such as lemon juice, tomatoes and vinegar when cooking with metals such as aluminum, you are safe with the glass bakeware. It is non-porous, meaning it will not absorb odors nor can it react with acidic foods. You are on the safe side with the BPA free glass bakeware. Also advantageous with glass bakeware is heat retention. If your guests are not ready to consume food immediately, the bakeware can retain the heat for quite a long time. But the drawback side is that it takes too long for the bakeware to bake your cookies because glass is a poor conductor of heat. If you are not in a hurry then it could be a great idea. The manufacturer is offering a 2-year warranty on any defects. Note that if not cared well, glass can break. These bakeware items come with ergonomic and comfortable handles for ease of handling. So the products will not fall unexpectedly. Eight pieces of essential items is enough to bakeware confidently. A glass bakeware is actually a good bakeware to consider. This set is nonporous, meaning there is no after-taste sensation like with metallic counterparts. You do not need an additional layer of coating because the glass itself is naturally nonstick. These are some of the features that impress me with the glass bakeware. On the flip side, I dislike the fact that it takes long to heat up. You have to preheat the oven putting the bakeware. But, nonetheless, I still recommend this glass bakeware. Because of its susceptibility to get broken, I would wish the manufacturer offered more than 2 years of warranty. But thanks to the easy to grip handles which help minimize the chances of dropping. What is a non-reactive bakeware? What is a Nonstick Bakeware? Let’s now delve into the buyer’s guide to help you make the right decisions in choosing the right bakeware. Different people have varying preferences when coming to picking the best bakeware. Such preferences could be inspired by different needs. For instance, one might need a muffin pan whereas one needs the whole set with all the essential items. Notwithstanding these different preferences, I have given you the best buyer’s guide to help narrow your search. I might have given the 5 best bakeware on the market but still find out that you struggle to choose the best among. There are factors you need to look at. While others prioritize the aesthetic appearance, I prioritize the bakeware materials. Bakeware can be made with plenty of materials that include the glass, ceramic, aluminum and stainless steel. In my reviews, aluminum, glass and carbon steel were the chosen ones due to their properties. Let’s differentiate these materials. As highlighted above, there is aluminum, steel, glass and ceramic, copper, iron cast, as common bakeware materials. The list continues… I have discussed a few which are used in my handpicked items. Aluminum – aluminum is a popular choice of many bakeware items because of its affordability and light weight. It is also durable, but not as steel is. Also noteworthy is the quality heat conductivity of this material. Nonetheless, aluminum with these properties is insufficient to endorse it for a bakeware because it is not nonstick. Manufacturers use an electrochemically processed anodized aluminum with enhanced features. At least it is low stick. More coating may have to be added to ensure a complete nonstick feature for your bakes. The metal is also nonreactive to acidic foods and is also scratch resistant. When cleaning anodized aluminum, I do not recommend a dishwasher as it can compromise its quality overtime. A nylon pad is a good choice to preserve the quality. An untreated aluminum is not a good choice at all as it can react with acidic food. It’s your duty to ascertain the quality of the aluminum material before making a purchase. In my handpicked products I have a treated aluminum. In most cases, a composite of aluminum and steel is used to improve the properties. Stainless Steel – it is renowned for its superb durability and non-reactivity with acidic or alkaline foods. However, it is not a good heat conductor. To compensate for this, manufacturers often combine the steel with other materials such as aluminum, carbon or copper to enhance its heat conductivity. Stainless steel does not scratch or dent easily with repeated uses provided is a heavy gauge steel. It is also easy to clean, but needs a nonstick coating to ensure a simple cleaning and food release. Glass – Glass is good in retaining heat. So, if you are cooking with glass bakeware, it will take time for the food to cool if not taken out of the bakeware. 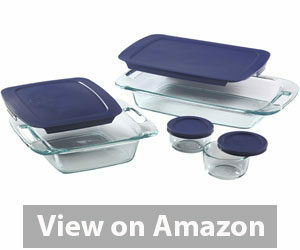 Again, glass bakeware is freezer safe, meaning you can store food with it without the need for additional containers. Although it retains heat well, it is a poor conductor of heat. It will take much long to bake with glass bakeware than you would with the carbon steel construction. In addition to glass, you may find the glass-ceramic or porcelain. The advantage with glass bakeware is that it does not react with acidic food and it does not absorb odors. Note that glass can break with abrupt temperature changes. It is therefore recommended to always preheat the oven. Knowing all these materials can help you in selecting the best bakeware set. There is still ceramic, cast iron and silicone. In the aforementioned products, silicone handles are included because of their head conductivity properties. The main term in all these materials is the “nonstick”. It’s a bakeware that does not allow food to stick on the surface after cooking or baking. The bakeware materials have coatings while some, like glass, do not because they are naturally nonstick. The coating is applied predominantly on the interior of the pans to ensure that food residues do not remain. A sticky surface may lead to crumble cookies or cakes. Again, it may need steel wool or sharp objects to clean the pot. The yesterday’s practice of solving sticky materials was to season the pans with oil or grease. This was, however, a waste. With the advance of technology, the bakeware is coated. But, note the different coatings applied. Look for the ones that are BPA, PFOA and PFTE free, because these are harmful chemicals. Usually, some metals such as copper and aluminum may react with acidic food in their purest form, unless coated with nonstick material. You may taste a metallic flavor after cooking your food. Stainless steel and glass are non-reactive. Glass is nonporous so it does not absorb any odor. You have to consider only the coated metals. Handles: The choice of your bakeware should also be influenced by additional accessories such as the easy grip handles. These make it easy to handle the pot without exposing your hands to heat. Even if there are handles, always use oven mitt to handle the pots. Rolled Rim Edges – these are also important as they enhance the durability of the pans and prevent warping. With repeated uses, the pans can deteriorate at the edges. The reinforced rolled rim edges can prevent that. Heat Sensitivity ­– heat sensitivity is also a good consideration when choosing the bakeware materials. Most of my products have a maximum oven heat of 450 degrees Fahrenheit. If exposed to extremely high heat, the bakeware materials such as steel and aluminum can fade in quality. Ceramic and glass are actually good at higher temperatures. Check the user manual for the restricted maximum heat. Variety of Essential Items – it won’t help to purchase a bakeware set and find out that most of the items you actually have. Look for the variety of items included such as the muffin pans, cake plans, baking sheet, cookie pans, etc. Buying the items individually can be costly, compared to buying them by a set. 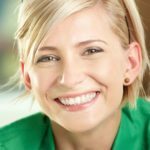 Warranty – warranty can be a determinant of good quality. If the manufacturer is convinced that the bakeware is of a top notch quality, you will often see the lifetime warranty or 10 years warranty. Those with a one year warranty do not really convince us that the manufacturer has put a great value of durability in them. As much as the bakeware can have warranty, note the restrictions that come with the warranty. Take care of the bakeware and do not subject it to improper cleaning or use. Otherwise that might void the warranty. Other companies expect you incur the shipping costs while others include them. This marks the end of my reviews and the buyer’s guide for the nonstick bakeware sets. I have reviewed the best on the market based on the materials such as carbon steel, processed aluminum and glass. The material is important when baking. In the buyer’s guide, I have discussed everything you need to know before making the purchases. This will help you narrow down your search because there are hundreds of products on the market. Little knowledge about the features may prompt a regrettable purchase. Enjoy your purchase and your baking!! !